THE ANVIL EXPERIENCE: Coming to Philadelphia January 17th! With four clicks on a drum, the song begins. As the first verse goes through your head, you know something epic and triumphant is coming. As the song slowly builds up to the chorus, the refrain comes in and the fists start pumping. The song is “Metal on Metal”, and the band is ANVIL. Anvil took the world stage by storm last year with the documentary about their life and struggle of starting a metal band and never, ever, EVER refusing to cave in and surrender! “ANVIL: The Story of Anvil” has won awards, prizes, and the rightly-deserved fame and recognition they deserve. You can watch the trailer for yourself. 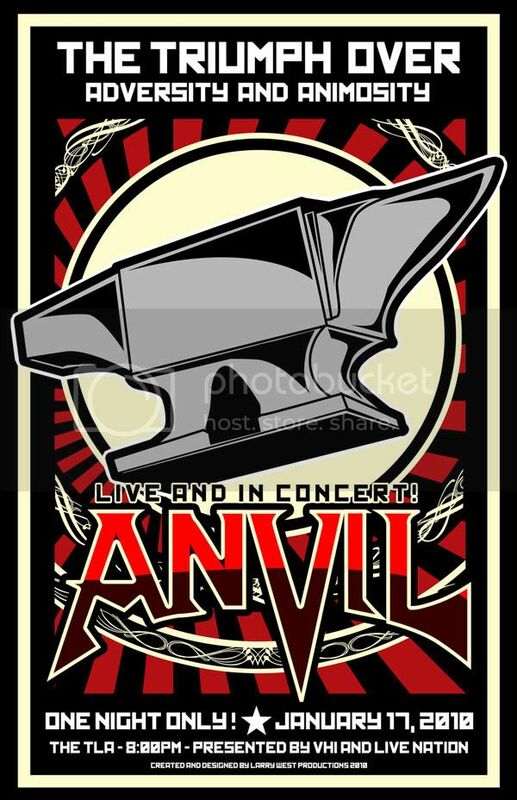 On January 17th, 2010, Anvil will come to The TLA here in Philadelphia. What you see above isn’t the official poster, but my art inspired by the story of this band, and my love of their music. Back in 2003, I bought the Metal Blade 20th Anniversary box set and there were two songs on there by a band called “Anvil”. The songs always stuck out in my mind and in 2009 when I heard that Anvil was coming to town based on a movie about their lives, I had to go. Since then, the band has always held a place in my heart. About a week ago I got a copy of “Metal on Metal” and thanks to that AND the fact that they were coming to town, I decided to do a tour poster for them! It was inspired by the feeling I get from them and their music, and the fact that, music aside, they’ve become something bigger than themselves: A symbol of the triumph of perseverance.